We’d love your help. 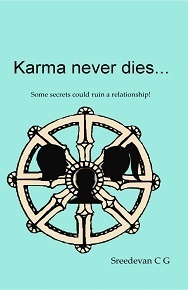 Let us know what’s wrong with this preview of Karma never dies... by C.G. Sreedevan. Dev leaves his parents in Kerala to return to Chandigarh- the city where he was born and brought up. Naturally he considers the city to be the place where he could shape up his career as well. At his first regular workplace he meets a girl named Surbhi and they become good friends. Suddenly an accident takes their relationship to another level but as some secrets of her li Dev leaves his parents in Kerala to return to Chandigarh- the city where he was born and brought up. Naturally he considers the city to be the place where he could shape up his career as well. At his first regular workplace he meets a girl named Surbhi and they become good friends. Suddenly an accident takes their relationship to another level but as some secrets of her life unearth, will Dev be able to handle this emotional onslaught? And will they keep their word of remaining ‘friends forever’? How do boy-girl karmic equations change at workplace? Will Dev realise that some secrets could ruin a relationship! To ask other readers questions about Karma never dies..., please sign up. Do you believe in Karma? If yes; Then the book ‘Karma never dies’ is a must read for you. And if your answer is negative, then try it and see how your opinion changes by the time you finish reading the book. The plot revolves around the life of a young boy named Dev, from Kerala who is born and brought up in Chandigarh. Although his family moves back to Kerala, Dev has his heart pinned to the city beautiful and thus decides to come back, despite disagreement with his family over the same issue. H Do you believe in Karma? If yes; Then the book ‘Karma never dies’ is a must read for you. And if your answer is negative, then try it and see how your opinion changes by the time you finish reading the book. The plot revolves around the life of a young boy named Dev, from Kerala who is born and brought up in Chandigarh. Although his family moves back to Kerala, Dev has his heart pinned to the city beautiful and thus decides to come back, despite disagreement with his family over the same issue. He finds a job at a Retail Outlet which is to be an important part of the whole plot itself. Through the book the author has portrayed and developed the protagonist’s changing relationships at his workplace, especially with his female friends. The author has used the relationship scenarios to bring forth both positive and negative effect they have on one’s life. This is how the lead character develops as an individual and learns that not everything is what is seems like. Thus by the end of the story we can find a truly rounded character, which has developed and learnt from his folly. As far as the other characters of the book are concerned, they are well developed and will grab your attention, since you can easily relate to their traits. All the characters are life-like, and in each one of them, you can find one of your own thought processes running. The plot mostly moves through a diary format, which the author could have worked on better, since the same diary approach leads to confusion at times. The diary approach does not let us view the characters from any other point of you, except the lead character himself. The writing style of the author which is mostly running in conversations becomes too lengthy at times, which could have been worked on better. But the book is written with a direct point of view to appeal the general public which means you won’t need a dictionary every second page. It’s easy, approachable and readable. I personally feel that the book could have been much more synchronized, had the author got a better editor at service.